Tycho was a Danish nobleman interested in astronomy. In 1572 a "new star" (in today's language, a nova) appeared in the sky, not far from Polaris, outshining all others. Tycho carefully measured its position, then measured it again 12 hours later, when the the rotation of the Earth had moved the observing point to the other side of the Earth. Such a move was already known to shift the position of the Moon in the sky, helping astronomers estimate its distance. The position of the "new star" did not change, suggesting it was much more distant than the Moon (click here for the rest of the story). This event so impressed young Tycho that he resolved to devote himself to astronomy. The king of Denmark supported him and gave him the island of Hven to build an observatory, with the taxes of the island providing him with the funding. The telescope had not yet been invented, and all measurements were done by eye, aided by sights (similar to those used on guns) which could be slid around circles, marked in degrees. Tycho extended such methods to their ultimate limit, the resolution of the human eye, and his star charts were far more accurate than any earlier ones. He even measured and took into account the very slight shift of star positions near the horizon, due to the bending of light in the Earth's atmosphere, similar to its bending in glass or water. And his observations of the planets became the most stringent test of the theories of Copernicus and Ptolemy. Concerning those theories, Tycho believed that all planets revolved around the Sun, but the Sun circled Earth. That view might have suited Denmark's Protestant church, for Martin Luther, founder of the Protestant doctrine, had rejected the views of Copernicus (who lived at the same time). Tycho's manners, however, were arrogant, and the residents of Hven complained about him, so that after the death of the king who was Tycho's patron, Tycho was forced to leave Denmark. He settled in 1599 in Prague--now the Czech capital, then the site of the court of the German emperor Rudolf--and there he became court astronomer. It was in Prague, too, where a German astronomer named Johannes Kepler was hired by Tycho to carry out his calculations. When in 1601 Tycho suddenly died, it was Kepler who continued his work. Kepler had studied astronomy long before he met Tycho: he favored the Copernican world-view and corresponded with Galileo. Planets move along ellipses, with the Sun at one focus. covers equal areas in equal times. Each of these statement requires some explanation. The ellipse, the shape of a flattened circle, was well known to the ancient Greeks. It belonged to the family of "conic sections," of curves produced by the intersections of a plane and a cone. planes are cut across a cone. --perpendicular to the axis of the cone, the result is a circle. --inclined so much that it is parallel to one side of the cone, a parabola. --inclined even more, a hyperbola. All these intersections are easily produced by a flashlight in a moderately dark room (drawing below). The flashlight creates a cone of light and when that cone hits a wall, the shape produced is a conic section--the intersection of the cone of light with the flat wall. The axis of the flashlight is also the axis of the cone of light. Aim the beam perpendicular to the wall to get a circle of light. Slant the beam: an ellipse. Slant further, to where the closing point of the ellipse is very, very far: a parabola. Slant even more, to where the two edges of the patch of light not only fail to meet again, but seem to head in completely different directions: a hyperbola. with k some constant number, the same for all planets. Suppose we measure orbital periods in years and all distances in "astronomical units" or AUs, with 1 AU the mean distance between the Earth and the Sun. Then if a = 1 AU, T is one year, and k with these units just equals 1, i.e. T2= a3. Applying now the formula to any other planet, if T is known from the observations of many years, the planet's a, its mean distance from the Sun, is readily derived. Finding the value of 1 AU in miles or kilometers, that is, finding the actual scale of the solar system, is not easy. This subject is discussed in the next section. Our best values nowadays are the ones provided by space-age tools, by radar-ranging of Venus and by planetary space probes; to a good approximation, 1 AU = 150 000 000 km. More will be said about Kepler's first two laws in the next two sections. Kepler's later years were not too happy. 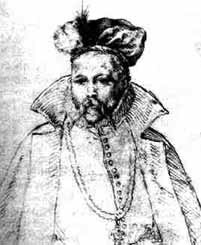 His patron, Emperor Rudolf, died in 1612, and although Kepler retained his post as court mathematician and continued to produce important work, his life was increasingly disrupted by war. That was the 30 years' war, a bitter religious battle which pitted Protestants against Catholics; it began in Prague in 1618 and engulfed all of Kepler's part of Europe. Postscript: The remanant of Tycho's supernova is still visible. 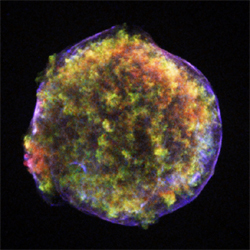 Above is its image made in 2005 by NASA's orbiting x-ray telescope "Chandra," (for a larger image, 296 Kb, click here; thanks to Randall Smith for pointing out that a different supernova in Cassiopeia was originally pictured on this site). The colors encode different ranges of X-ray wavelength; for more details, see here. (see also here). You might compare this to another picture of this supernova remnant. For more about the "Chandra," observatory, see its web site (click here to return to the top of the page). Questions from Users: What if the Earth stopped in its orbit? *** What do we do about the atmosphere shifting positions of stars? Willman-Bell, publishers of astronomy books (http://www.willbell.com) is offering "The Lord of Uraniborg" by Thoren, a biography of Brahe, and "Kepler" by Casper. See also the end of the preceding section, concerning "The Sleepwalkers" by Koestler.